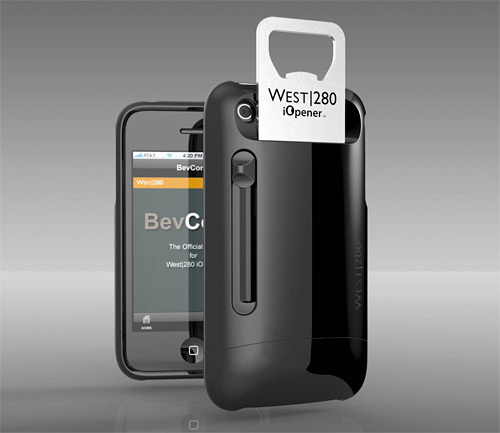 By itself, the West|280 bottle opening iPhone case, cleverly called the iOpener, is just another novelty accessory that most people will probably roll their eyes at. But there’s more than meets the eye. As cases go it’s made from a plastic polycarbonate/ABS alloy which keeps it lightweight but also strong enough to endure the rigors of removing a bottle cap. And the bottle opener, which retracts into the case when not needed, is made from 14 gauge, 304 food grade stainless steel, polished with a special process so it shines without added materials like chrome that can flake off over time. The inventors, Clay Baker and Tom Ramies, clearly didn’t skimp when it came to choosing high-quality materials. But they also realized that the case could be more than just a novelty. So the iOpener incorporates an accelerometer that knows when the encased iPhone has been inverted and moved with enough force to open a bottle cap, which then triggers an accompanying free app called BevConX. (This ensures the odds of it being triggered accidentally are pretty slim.) Once loaded the app automatically asks the user to specify what beverage they just opened, from a list of 1,200+ options. The time and location are recorded, and you can then of course share your choice on various social networks. You can even set the app to play your favorite song every time it launches, if a bottle opening iPhone case isn’t novel enough for you. At the moment the iOpener appears to only be available in a black or white version for the iPhone 3G/3GS for $29.95, presumably because it took Clay and Tom so long to develop the original version. So hopefully if it becomes a success an iPhone 4 version will soon be on its way.